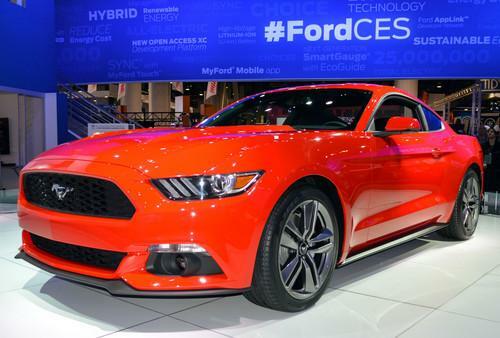 The 2015 Mustang saw its first public appearance at CES. As car-sharing and ride-hailing apps make it ever easier for people, especially the urban young, to shrug off the expense of actually owning a car, at least one automaker wants to get in the driver's seat and steer the trend in a more favorable direction. Ford is launching a pilot car-sharing program in six U.S. cities and London, CNBC reports, and will let customers who use the carmaker's financing program rent out their vehicle via the Getaround sharing app. U.S. government organizations are struggling when it comes to securing the software they use, according to a report by application security firm Veracode that puts government in dead last place among all sectors. Problems include use of old scripting and programming languages, failure to self-regulate and failure to impose security requirements on software suppliers. Google intros free streaming music, but can it make the ads less intrusive? Free music streaming services, like commercial radio, have a problem: those irritating ads. But perhaps Google, with all it knows about you, could make the ads less irritating, more interesting? Computerworld reports on Google's entry into the free music streaming market. The U.S. Department of State is back in the business of issuing visas after a computer system failure abruptly stopped work at consulates worldwide and inconvenienced hundreds of thousands of travelers. The failure of an unidentified piece of hardware involved in biometric processing -- not a cyberattack -- brought the entire Consular Consolidated Database system to a halt. The groundswell of distaste for what the Confederate flag has come to symbolize in the U.S., provoked by a racially motivated mass shooting last week at an African-American church in South Carolina, has spread to online retailers. Amazon, eBay and Etsy said they would stop selling flags and related items on their sites. EBay called the flag "a contemporary symbol of divisiveness and racism." The U.S. Securities and Exchange Commission is concerned that data stolen from companies in cyberattacks is being used to conduct insider trading, Reuters reported. The securities regulator asked at least eight publicly traded companies for information on data breaches, as it probes a group known as FIN4. The hacking group has targeted more than 100 publicly traded companies or advisory firms with sophisticated spear phishing attacks, according to security researcher FireEye. The U.S. Navy is paying Microsoft millions of dollars to keep up to 100,000 computers afloat because it has yet to transition away from Windows XP. The Space and Naval Warfare Systems Command, which runs the Navy's communications and information networks, signed a $9.1 million contract earlier this month for continued access to security patches for Windows XP, Office 2003, Exchange 2003 and Windows Server 2003. The first three of those products have been deemed obsolete by Microsoft, and Windows Server 2003 will reach its end of life on July 14. Google has driven its Street View cameras through cities all around the world, pedalled and paddled around a few more, and even hiked into the Grand Canyon. Now, says The Verge, it's published its first vertical journey -- up El Capitan, a popular destination for rock climbers in Yosemite National Park. IBM and cooking magazine Bon Appetit created a web app that helps you find and create recipes using IBM's Watson cognitive computer. Download this tale of life in the mountains of West Virginia to your tablet and then put it in airplane mode before reading: The Guardian tells the story of the town that banned Wi-Fi.